Pleasant surprise on this Wednesday 10th morning. Receiving a tip about PS4 Valkyria Chronicles themes, I peek on the Japanese PSN. There I do find the aforementioned themes… but also Valkyria Chronicles Remaster itself! That means the very anticipated Valkyria Azure Revolution demo is available too! Without any hesitation, I use the remaining credits of my digital wallet. The demo will download very fast, but I do need to work to throw all this money in the PSN. I’ll have to wait until the evening. Bad luck, Sega has locked the PS4share so I’ll mainly have to use official screenshots. The demo starts by giving an insight of the story : during the 19th century, in a fictional Europe, the Ragnite ore lead to an unprecedented industrial revolution because of its magical properties. Mankind quickly learned to fuse it with technology and armies soon came to develop equipment with magical capabilities. Like any coveted resource, Ragnite created conflicts. The Russian Federation (yep, it’s straight out spelled as Russia) progressively sought to blockade the Kindgom of Jutland. Cornered, the small state has no choice but to wage war and quickly sends its anti-Valkyria unit, Vanargand. Notice the wolf slaying the reaper on the emblem : in this new game, the Valkyria symbolizes death and not salvation anymore (although the Valkyria was already polysemous in the first trilogy). And to the frontline we go with our team of three : Amleth, the dark hero who swore vengeance against the Empire, Ophilia, the princess of crimson eyes, and Brigitt, former teacher and trained sniper. The gameplay is quite unsettling because it mixes Strategy-RPG and Action-RPG. 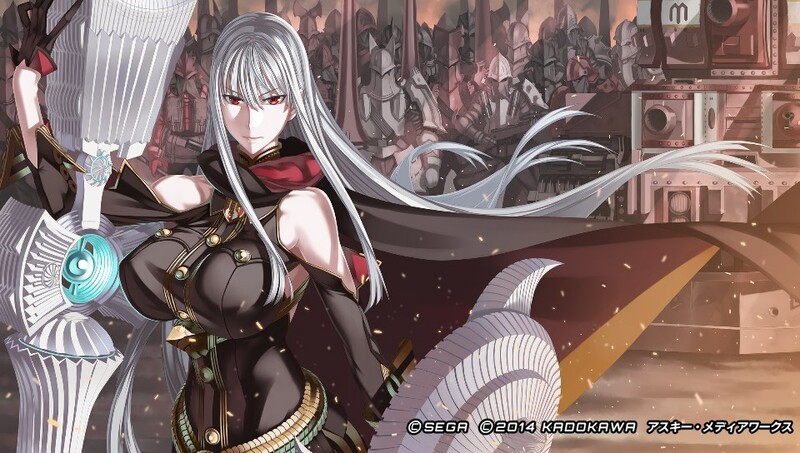 I already see lots of comparisons with Shining Resonance, but let’s be serious, Valkyria Aure Revolution is a lot more than that. Your group will have to act so as to enter battle in the best possible conditions. It’s fairly important to be stealthy, use suppression fire, use cover to launch surprise attacks… because enemy soldiers aren’t dummies and can spot you from very far. Once you are in contact with an enemy unit, your characters will draw their blades and enter close quarters combat. Unlike Valkyria Chronicles, everything happens in real time. This is where the comparison with the other RPG from Sega makes sense. For example, if find the skill sub-menu on L1, allowing you to cast physical or magical special skills, as well as heal yourself. Bear in mind that there’s a limited number of magical slots to be used, so you might want to save your skill for critical moments. Let’s also stress that you can still use a firearm in close quarters combat, in case you’d want to attack from mid-range and avoid taking too much damage. You can lock any enemy with R2 with ease and the controls in general felt quite precise after a few battles, despite the large number of buttons to consider. Although it’s an introduction to the game, the challenge is no joke and your characters can fall very fast if are are careless (but it’s also true that the allies’ AI is a bit questionable in this demo). In case of KO, like in Final Fantasy XV, a simple slap in the back and they will be back on their feet. This is seriously ridiculous and I do hope the medic will return in the final version. Finally, note that after a game over, the player can retry the mission while keeping the acquired experience. Valkyria Azure Revolution introduces psychological warfare. Some of the action you take before going into close quarters combat can confuse, startle the opponents or make them angry. This way, they will be weaker, slower or less precise. For example, taking cover behind a wall and opening fire when a enemy group passes by causes panic to them for a while. There’s also a positive status called “bravery” in which the characters’ defense is raised for a short time, so that he or she can take more risks and sweep the enemy. Each party member has a secondary weapon (but with a limited number of uses) allowing him/her to get the upper hand. Ophilia possesses smoke grenades that can blind enemy soldiers, and Brigitt can take them out from afar thanks to her sniper rifle. 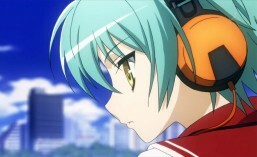 I case she kills a sentry without being spotted, all the soldiers in the vicinity will be tense! Like in Samurai Warriors 4, the long bar on the top of the screen tells you on which side the morale is better. Technically speaking, it’s a lot sharper and more detailed than Valkyria Chronicles as you could expect, the Gouache 3D engine being a worthy heir of the previous Canevas in its painting-like aspect. True, the village represented here wasn’t anything impressing and the frame-rate did suffer a couple of times, but it’s still a nice sight to behold for a first contact. Also, the more realistic design gives a fresh feel to the series and a deeper immersion, a bit like when you jump from Advance Wars Dual Strike to Dark Conflict. There can be no greater delight than getting back in the Valkyria series with the power of the PS4 and the unscathed war atmosphere. The game system arouses interest, because it looks very complex and necessitates to master two types of games at the same time. Needless to say, I’m hungry for larger campaigns even though the strategic side seems to fade away a bit. Sega won’t uncork the champagne this year. The conglomerate it shares with Sammy loses more than ¥11 billion, whereas they had gained ¥30 billion last year. The slower revenues and the rising general expenses destroyed the EBITDA, and several write-downs made it even worse for the net result. On the consumer business side, that is to say video games, anime and toys, Sega blames the physical games market for being increasingly sluggish. Indeed, despite a 15% rise in volume of sales, boxed games cause an operational loss of nearly 3 millions! The digital content on the other hand (smartphones & PC) provide a ¥8 milllion gain. Clearly upset, the publisher states that it will shift resources from the traditional games market to mobile, while giving guarantees on Persona 5. Sega wants to lift the doubts : although the current restructuring in the West is severe, there are no plans to drop consoles. Yakuza 0 sold very well in the rising Chinese market, so the firm is still committed to quality and innovation and teases an “announcement” at Tokyo Game Show to back their intentions. Sega-Sammy’s balance sheet is unchanged : this year’s loss barely damaged their equity, that remains strong of years of retained earnings. The group is not weakened and has the capacity to fulfill their pledge and our dreams : more ambitious games. The reveal of Seven Dragon III on 3DS doesn’t improve their case, but the port of Blade Arcus from Shining on PS3/PS4 is a step in the right direction. All they need to do now is to race to excellency. 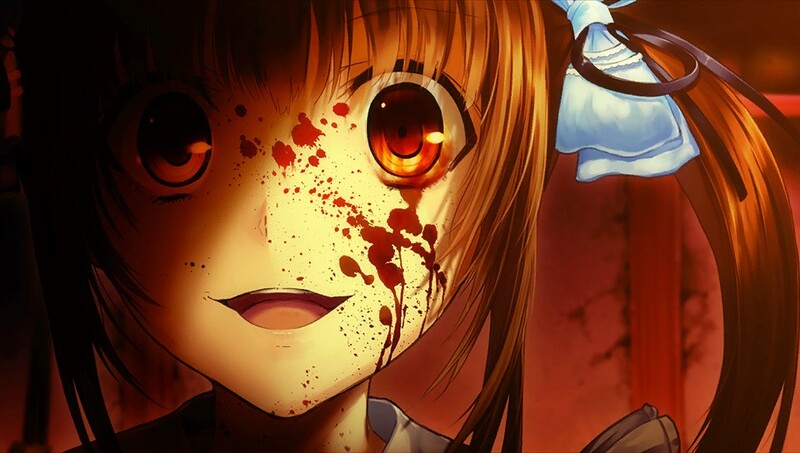 With no known equivalent in the West, Japanese light novels are quite a thing in Japan. Worshiped by otaku circles, those bizarre stories mixing action, love, science-fiction, fan-service and humor sell large volumes at each new issue and become animes in a blink of an eye. Reading is good, watching’s fine too, but playing is even better and Sega knows it. 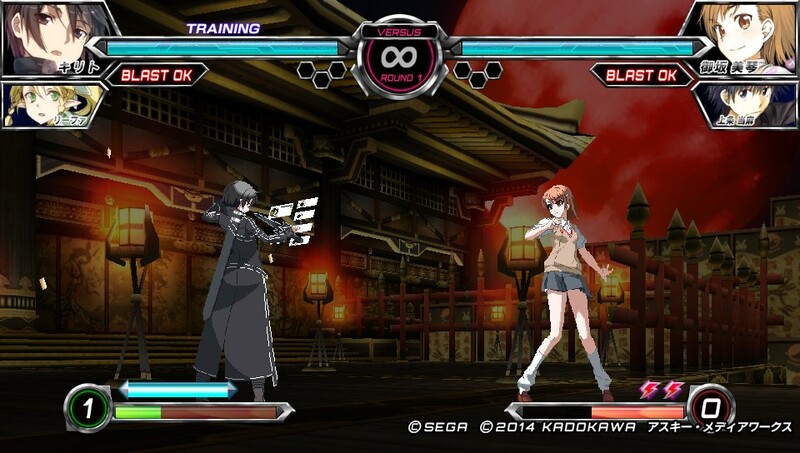 The fans’ aspiration for direct action now comes true with Dengeki Bunko Fighting Climax (FC). 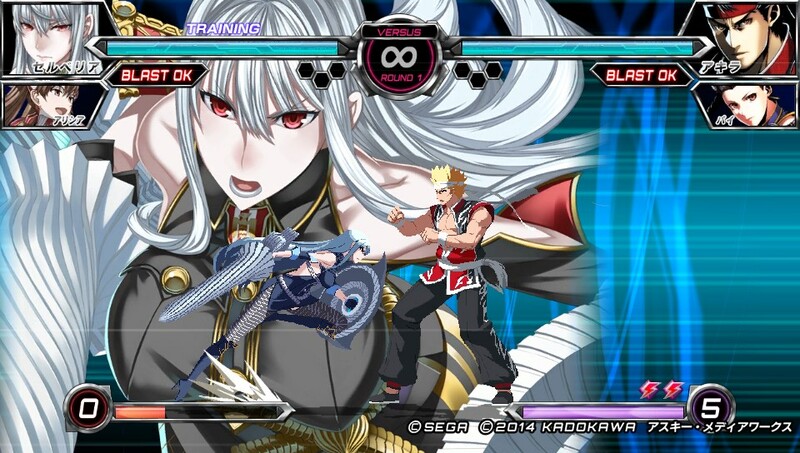 While the game design of this 2D fighting game is fairly classic, its playable characters aren’t. You’ll have the great pleasure to play as the most famous heroes/heroines from a dozen of series. Characters well-known in the West as Asuna and Kirito from Sword Art Online come alongside less renowned ones like the basket-ball star schoolgirl Tomoka from Ro-Kyu-Bu, plus some guests like Akira and Pai from Virtua Fighter (who have a tendancy to gatecrash every fighting game since they don’t have their own anymore). In terms of game modes, you have the usual suspects : Arcade, Story, Training, Survival, Time-attack and Versus await you. Arcade feels a bit repetitive, but the point of an arcade mode has never been to tell a story. In fact, the little narrative behind it, however simplistic, proved intriguing enough and features surprising metaphors. 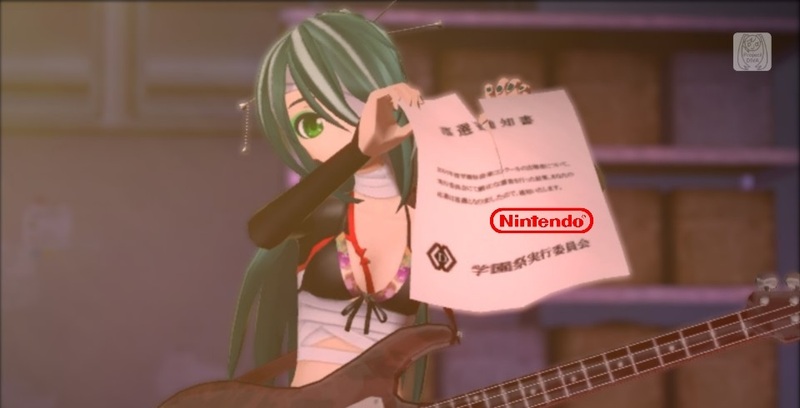 For example, the girl designed by Kei representing Sega’s last console asks you to save the dreams. In other terms, in FC, you must save the Dreamcast! On the other hand, the story mode exclusive to the console version turned out to be no more than a series of mini dialogs. I did expect a lot more substantial content. The whole game is nevertheless extremely well dubbed and transcribes the atmosphere of the Dengeki series in an astonishingly wonderful way. 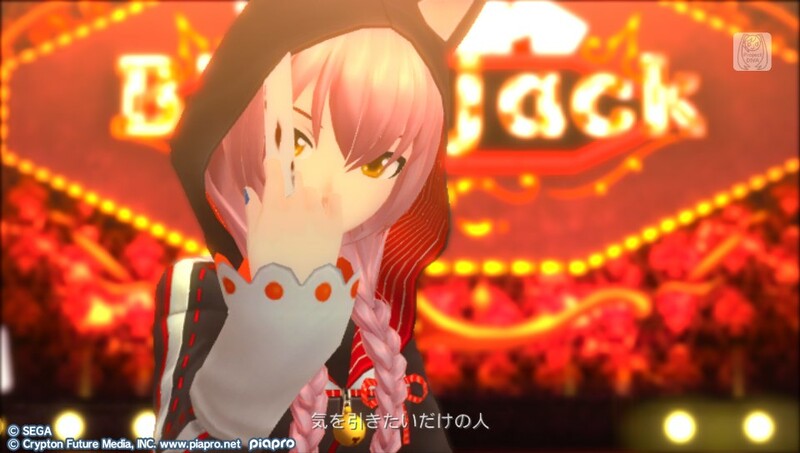 Should it be Taiga’s extravagant behavior, Miyuki’s Magic or Tomoka’s shoots, FC spares no effort and goes as wild as needed to delight the fans. Kirito is especially cool : everything in its lines, attitude, moves and of course its amazing Double Edge Sword remind us of what’s amazing in Sword Art Online. Selveria being an unlockable playable character also is a huge plus, and she’s an extremely effective character and fun to play on the top of that. Graphically speaking, the 2D sprites on PSVita have a lovely feel in them, but animations look a bit jerky. The 2D models during talk parts are the ones from the novels and not from the anime. It kinda gives a fresh look to the characters and the animation are rather cute/fun despite no lip sync. Music is way above your average fighting game, with a beautiful theme song and quite great and entertaining composition. Each character’s movelist being ten lines or so, you could believe that FC lacks depth. Far from that, it’s actually a vastly technical game. You just have to spend some time online to ascertain that : skilled players build impressive combos, proof of a vast amount of time spend in training combining moves with one another. The annoying thing is that it makes it difficult for people not used to 2D fighters to enter the fray online : FC’s gameplay tuning is made for experts. It’s really a shame because the controls are quite fine even on PSVita, on which the stick allows you to perform half/quarter circles with ease. 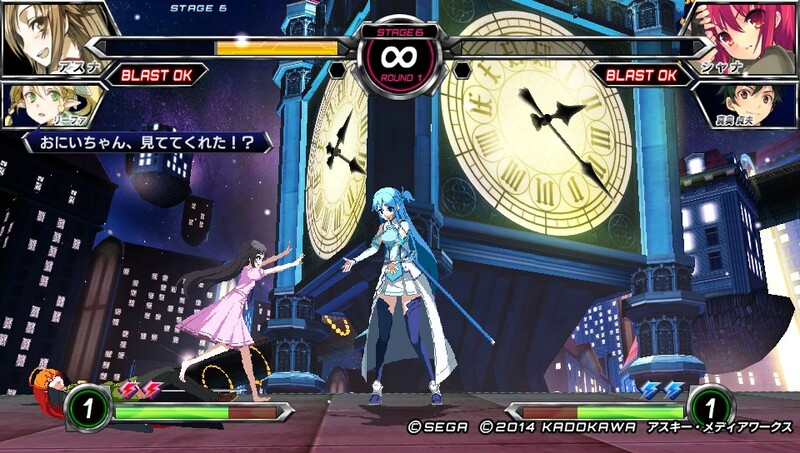 Adding to traditional combos and moves, FC has 3 original elements : a support character, a kirifuda and a Climax gauge. The support character attack or defends depending on whether you press X ou X+direction. Effects and range being quite different from one another, there’s already some training to do in order to find the one that fits your way of playing and calculate timing in battle. Kirifuda is a special move a bit more powerful than the others or a boost that gives you some advantages. They’re pretty uneven : Selveria fires a whole magazine of her personal rifle, while Shana’s is an all-cancel that refills a bit of her Climax gauge. 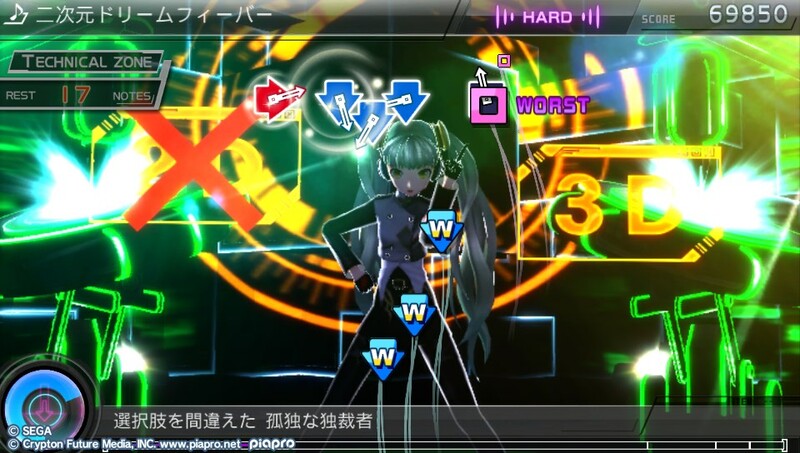 The above mentioned gauge is used either to give an additional blow to the square button combo (consumes one bar), or unleash extra powerful techniques known as Climax Arts (two bars). Here’s the problem : the latter are next to impossible to execute successfully in a serious match. The range is short most of the time and normal guard blocks them. The only way to have them hit is to imbricate them in a longer combo. Good luck with that… Consequently, it is often more beneficial to use the extra square hit which is a lot more practical. Further in this logic, this almost unbreakable guard discourages risk-taking and tends to turn online battles in defensive/long range confrontations which is hardly fun. Let’s stress that unlike the 3D fighters I know, here you can’t perform combos unless you actually hit your opponent, so no approaching while being covered. You’ll have to cautiously monitor your distances if you don’t want to become full of openings. Last point, FC is rich of bonus content. There’s whole range of customization items such as colors/plates/icons and even the authors’ & voice actors’ autograph, plus some well-chosen illustrations and a chapter to read! 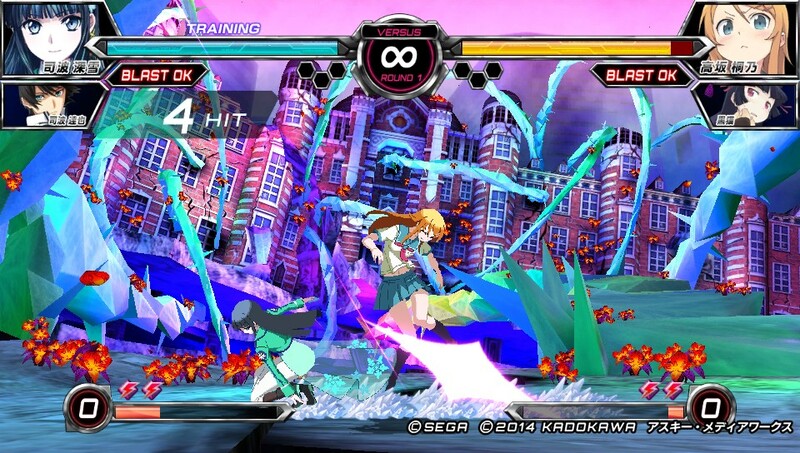 Dengeki Bunko Fighting Climax is a very enjoyable fighting game, so well-thought for its targeted audience that it’s impossible to get bored if you like Dengeki series. It is just sad that gameplay arbitrations make online less fun than it should have been. 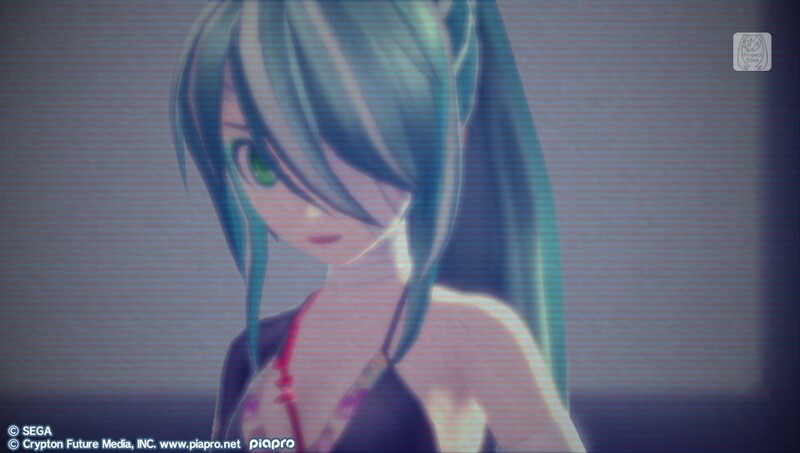 Project Diva F on Vita has been for me a great discovery. Fun and arenaline rush like I hadn’t known for a while in a video game. The excitment was therefore high when booting this direct sequel. Excitment that stayed at maximum level until the end. 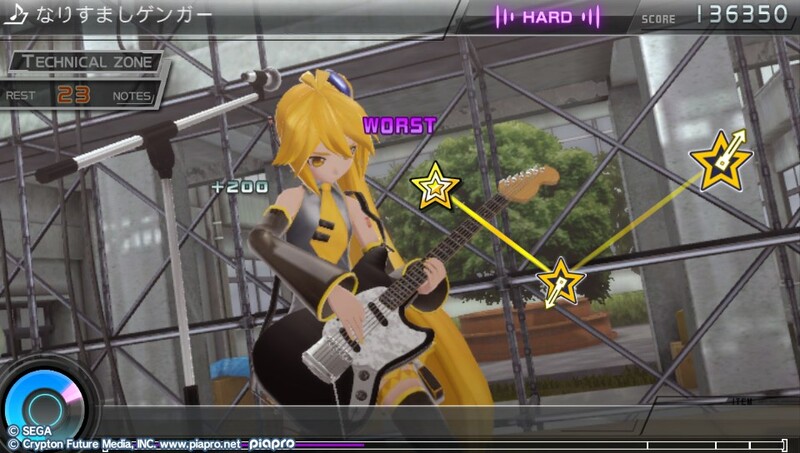 In terms of content, Project Diva F 2nd (PDF2) inherits the principle of Project Diva Extend (PSP), that is to say half new songs, the other half being songs taken from previous episodes. 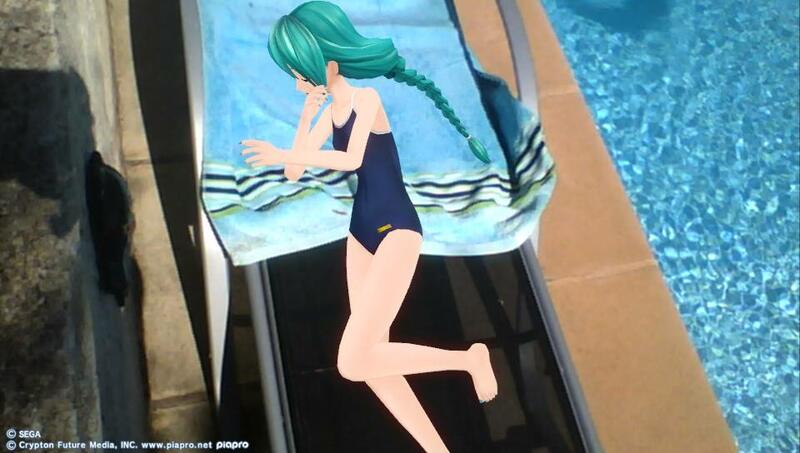 In the case of PDF2, those ones come from the PSP games Project Diva 2nd and Project Diva Extend. 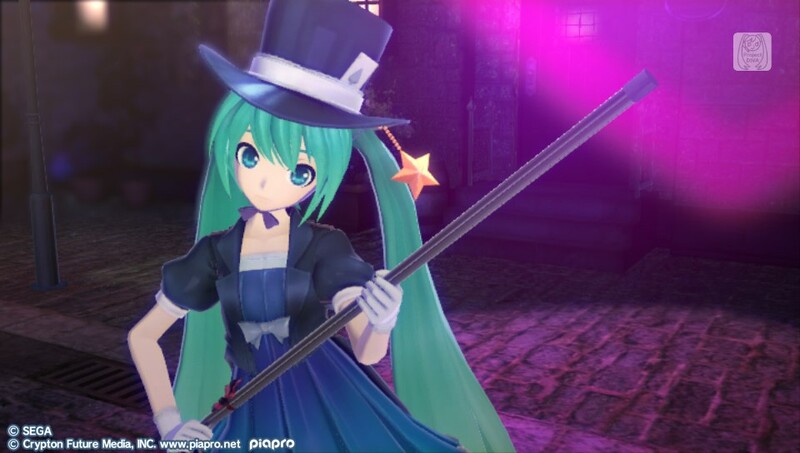 Before complaining about rehashing, bear this in mind : while Project Diva Extend was merely transferring songs from Project Diva 2nd, PDF2 remakes them from scratch. Two-faced Lovers, Romio & Cinderella or Luka Luka Night Fever to mention a few, have been completely remades and not just remastered : choreographies have been changed in several aspects, especially by adding a finale like it was introduced in Diva F. No only this, but the incredible 3D engine of the «F» series transforms the hits of the previous generation and the astonishing graphics further enhanced from Diva F (PDF2 looks quite sharper) make it a whole new experience. As for the new songs, I found the list pretty uneven compared to Diva F which was a true concentration of musical masterpieces. Many have slow rythm or not enough intensity for my tastes. But whatever, that’s just me and I did find a few exhilarating compositions like Yubikiri, Ni Soku Hôko, Envy Cat Walk, Meteo 2nd Dimension Fever and Akatsuki Arrival, let alone the fantastic design and direction that mix elegance and cuteness in wonderful fashion. You’ll of course also get a new range of nice modules (=costumes) with the possibility to import the ones you already have in Diva F. In pure aesthetics, you have now an option to put a skin on your progression bar. While I think it takes too much room on the screen, some may please you. Note that if you want more, Sega has planned a looong DLC season to destroy your savings with seriously exciting stuff : the Japanese version already got Change Me, Kochi Muite Baby, Yellow and Sekiranun Graffiti, among others. Remember that if you have the extra character DLC for Diva F, you can get it free for PDF2 as it’s cross-buy. The most striking thing about gameplay is that the game became A LOT harder. If like me you’d come to master progressively the Hard mode without making wonders in Extreme, drop by the chemist’s to get some anxiolytics because you will suffer like hell. Narisumashi Ganga and 2nd Dimension Fever are inhumane, Envy Cat Walk drove me mad. It’s my concern with PDF2 : the Normal mode is still a bit too easy for returning fans, but Hard mode is discouraging sometimes. Generally speaking, the challenge has been beefed up in several ways. Remember the yellow stars for which you just had to scratch the screen continuously? That’s over, Jim! From now on, you’ll have to follow the pace. Technical zones have become a lot more technical, those bonus points are no longer offered like they used to be (Huh, God Tier Tune?). This episode comes out with new types of stars. 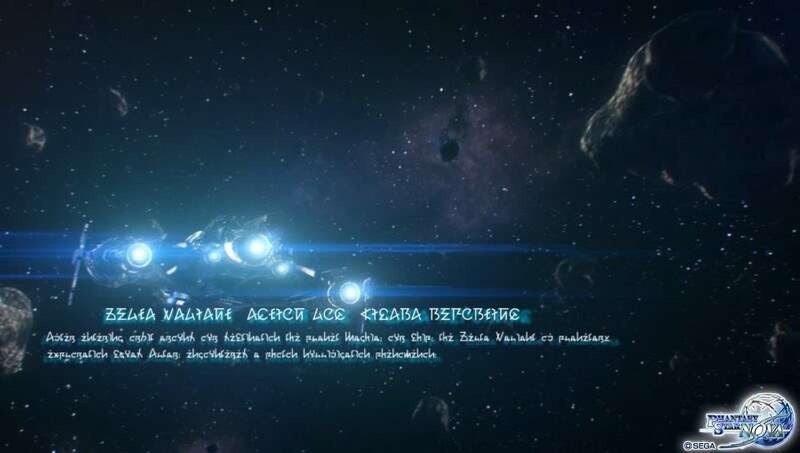 There’s the «big» star which is cleared by scratching the screen in two different locations, and the «linked» stars, that are actually normal ones with more bonus points. All the side content is still there and has improved. The Diva Room, the now famous dating sim is more lively than in the previous game : the number of events have doubled, they’re triggered more often, yo have new mini-games and characters show a lot more actions/reactions. Camera angles have been nerfed a lot though, especially in close-up, which is definitely unwelcomed. All the friend level parameters have been tweaked to allow a more precise progression. The much sharper graphics add greatly to the enjoyment of this Diva Room 2.0, which more than ever is a game in itself. 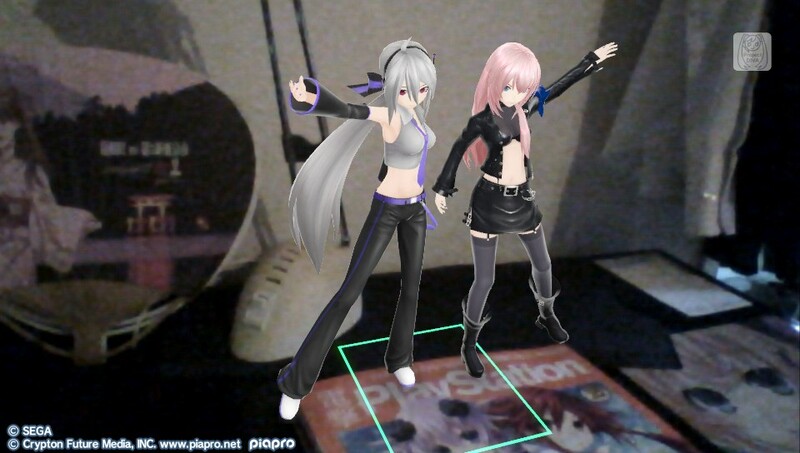 The game comes with a dozen of new AR lives, save that now you no longer need the AR markers to organize your private performances! Despite the small hiccups in gameplay and balance, the immense delight is still the same. 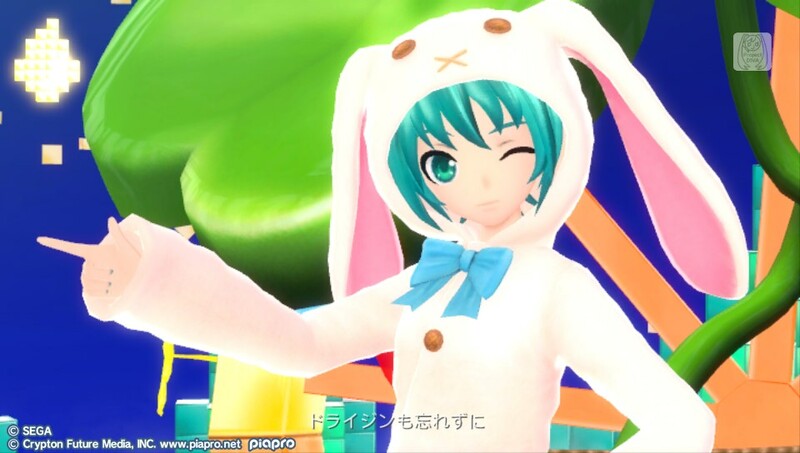 Project Diva F 2nd is pure and immediate joy until the end. That is, if you can see an end to a game you never really stop playing. With the demo available on the Japanese PSN late August, I could give a try to Sega’s major exclusive for this end of year in Japan. 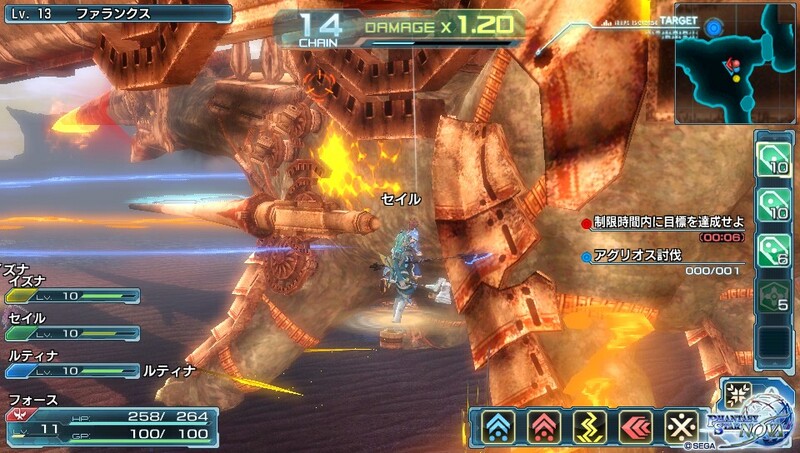 Whereas Phantasy Star Online 2 is online only, Phantasy Star Nova (PSNova) is thought as a single player game. 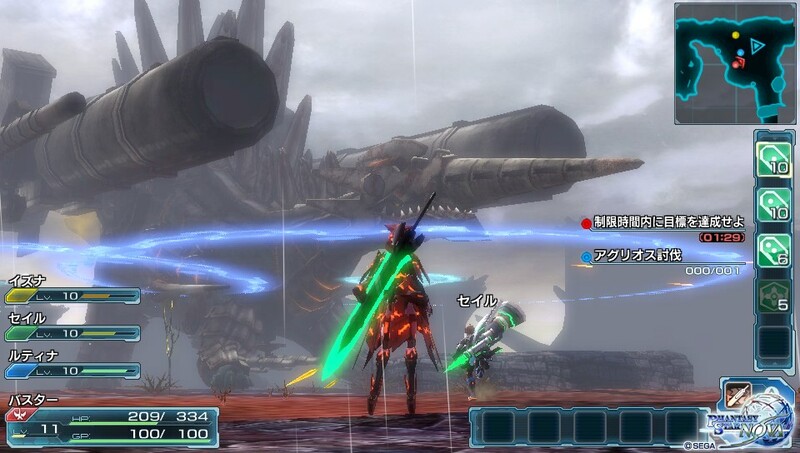 The game system is roughly similar to God Eater, that is to say a solo adventure with an actual storyline, in which you can invite you friend in local multiplayer. The world where PSNova takes place reminds us about Star Ocean 4 quite a lot. Nothing surprising since the developer behind both games is the same : Tri-Ace. So we’re off exploring inhospitable exoplanets. That said, mechanical rabbits and armored dinosaurs make a rather bizarre bestiary, far less impressive than God Eater or Monster Hunter. Some of them are gigantic, but that’s the only thing about it. Technically speaking, it’s quite magnificent : characters as well as environments have been modeled with great care, which makes it a top game as for graphics. A true pleasure reinforced by the character design, classy as always in PSO. 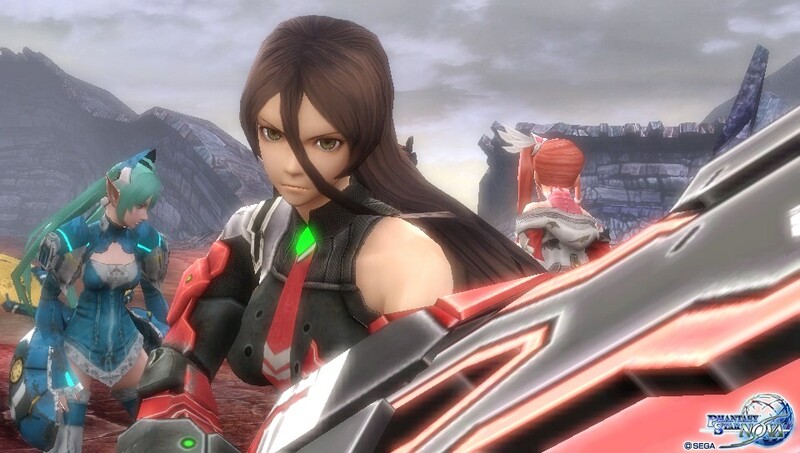 However, it’s a shame that like in God Eater 2, you can’t play as such attractive secondary characters. Also, the sound environment felt pretty poor : bland music and worse of all, terribad English voice-over! 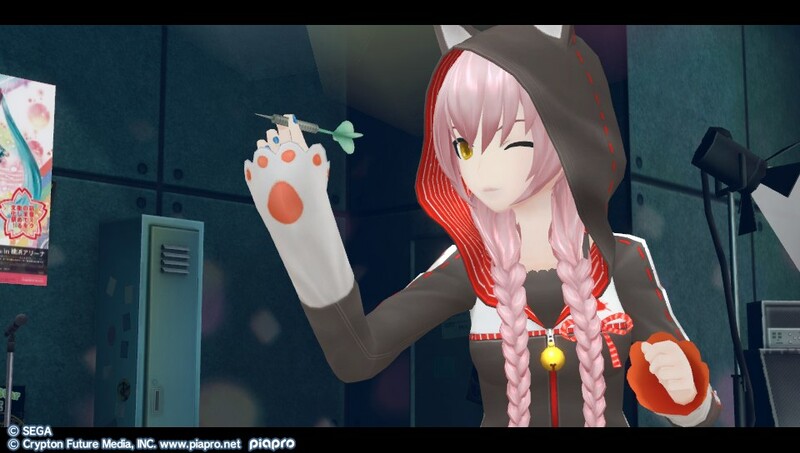 Like in PSO2, the player creates a character of his own. This demo was fairly limited though : only 4 classes available and non-customizable in any way! It gives an impression of rigidity a bit unsettling… I tried the two female classes in the one and only mission selectable. 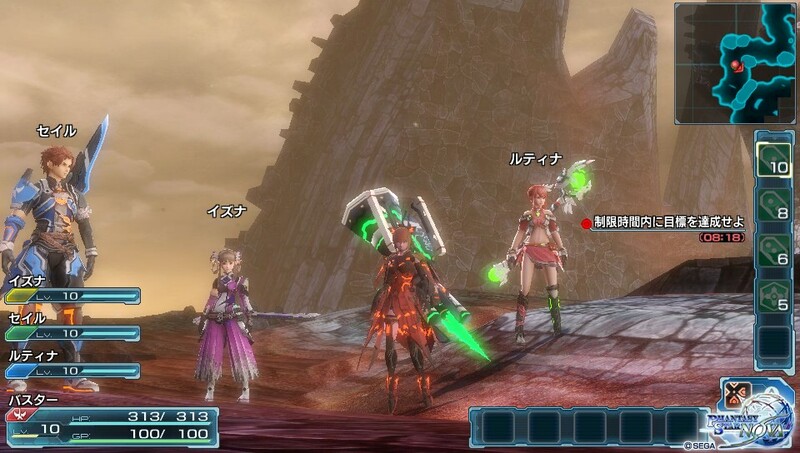 No real issue in gameplay, the good old PSO2 recipe still works well. Dodging, combos, magic, lock, heal via touchscreen… Tri-Ace delivers. Each class has 3 or 4 different weapons. There seems to be a lot a possibilities, although none of the characters showed very nervous gameplay. My main worry is that like Tôkiden, the action is kinda slow and it’s not as thrilling as God Eater 2 in that department. True, it might vary depending on classes and weapons, but I’m yet to be convinced on this. On the other hand, PSNova seems more challenging than God Eater 2 : your character will drop dead quite fast if you’re careless, and the number of revives looks limited at higher level. Impossible to say much on the story, but the Star Ocean feel is real and engaging. In short , a demo too much limited in every aspect, but with there is definitely some charm in PSNova.